•For a stress free 2017 CSU game day experience - leave early! As students, fans and alumni all figure out parking, tailgating, ticket pick-up and traffic patterns, there is sure to be lots of confusion. Give yourself lots of time to get to the stadium. •Live in Fort Collins and bike or walk. Being one of the most bike friendly cities in the country, this is an easy way to get to the stadium on game days from virtually any neighborhood. There is a great map showing the best bike routes created by the City or Ft Collins and the university (click here). A bike valet will be located on the north side of the stadium. •Transfort & The MAX. Running the length of the city, the MAX can pick you up at any number of locations to the south and north of campus and drop you just a few blocks from the action(see Google map). Don’t forget the bus system, which will be running on game days. For complete information on Transfort gameday info go to ridetransfort.com/gameday. Transfort is running 16 buses along the MAX line (usually, it runs six), meaning there should only be about three minutes between buses at MAX stops. 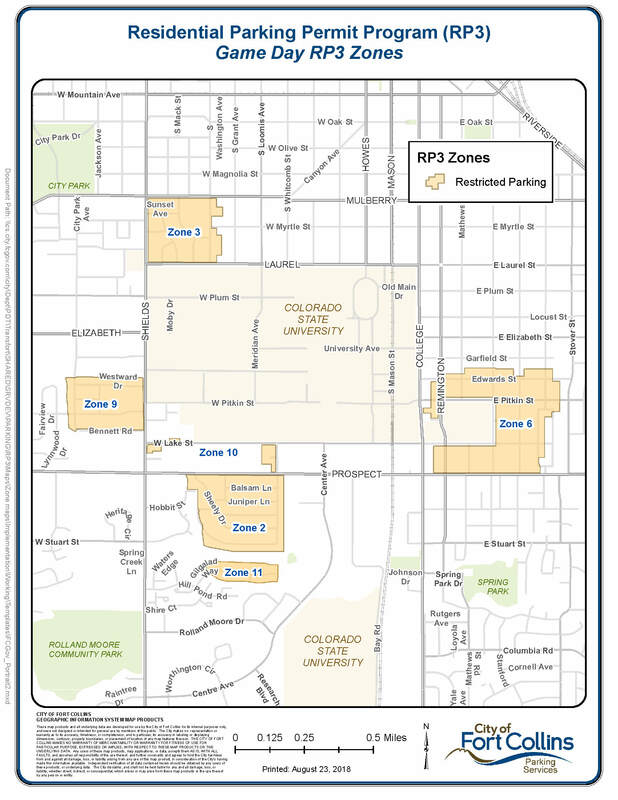 ​•Buy a prepaid parking spot from CSU to ensure a spot on game days. On campus parking spaces are available. To obtain these you will need to contact CSU and there is a cost (click for link to pre-paid CSU on campus parking). Be sure to check out instructions for the parking spot you purchase. RV parking and tailgating will be at Moby and also requires prepaid parking. Park in a neighborhood near the stadium and get your car towed. The city will be aggressively towing cars on game day - DO NOT PARK IN NEIGHBORHOODS NEAR CAMPUS where the city has implemented a Residential Parking Permit Program (click to see map) These neighborhoods primarily to the west, south and east of stadium. Here is a link to the city’s website. Game day information link for CSU vs. Oregon St, August 26th - the first game. Parking lots and transit service for the games begins at 8:30am on game day. There will be Rambassadors located all over campus to help you find your way and answer questions. We'll be located on Centre Avenue between our RE/MAX office and the stadium - see you Saturday. August may feel a little early to be thinking about prepping your roof for the fall and winter, but it’s much easier to inspect and fix your roof now when it’s sunny and warm than it is to do it when it’s cold and windy or raining or snowing. Joan Crowe, director of technical services with the National Roofing Contractors Association, Rosemont, Ill., says that homeowners frequently ignore the roof and start paying attention only when there’s a problem like ice dams or interior water damage. And when they do head up to the roof, they’re often armed with a shovel or pick to break up ice and remove snow. Big mistake, according to Crowe. Those tools can compound the problem because you could accidentally puncture the roof. It’s better to keep problems at bay by doing routine inspections and maintenance and so you can spot small problems before they turn into costly repairs. 1. Inspections. Inspect your roof at least twice per year in spring and fall. Also take a look after big storms – hail, snow, wind, and excessive rain – to be sure they didn’t cause damage. 2. Shingles and flashing. Look for shingle granules in your gutters. “They’re a protective surface and when the granules come off it’s indicative that a shingle is failing,” says Crowe. And if you have one failing shingle, chances are there are others too. Look for shingles that aren’t flat and are buckling, curling or blistering. Though sometimes they can be fixed, damaged shingles are often a sign that your roof is coming to the end of its life. Look at the flashing (the material used to seal and weatherproof a roof’s edges, joints, and so forth) around openings – pipes, skylights, and chimneys, for example – where water can get in. 3. Interior inspection. Look for water damage on celling and interior walls. Also if you can see any light through your roof – even an opening the size of a pinhole -- call a roofing pro. Small breaches can be the start of something much larger. Keep in mind that nothing last forever. Crowe says you can expect to get about 15 to 20 years out of a roof. 4. Clean up. Remove debris like leaves, twigs, and branches from the roof. They can harbor moisture and prematurely degrade the roof. Clean your gutters in spring and fall to prevent a host of problems, including rotted wood, leaks, foundation damage, and mosquito and insect infestation. 5. Hire professionals. Rather than taking a DIY approach to repair such an expensive system of your home, consider hiring a professional roofer. They have the skill and experience to diagnose problems and the tools and materials to fix a roof properly. Learn more about choosing and finding contractors here. 6. Safety. Another reason to leave it to a professional: “We don’t want homeowners climbing ladders, walking around on a roof, and getting injured,” comments Crowe. Keep in mind that in 2013, 175,790 people were injured on ladders severely enough to require a trip to the hospital, according to the National Safety Council’s Injury Facts. Before getting up on your roof, review some safety precautions.